The world is going to Pott! Except this is the type of Pott you drink, and not smoke. Wine lovers have been purchasing and tasting the wines of Aaron Pott since he founded the estate in 2007. Aaron Pott graduated from UC Davis before becoming an intern with Robert Mondavi. From there, he took a position at Newton Vineyards before a stint in the Right Bank of Bordeaux. With the help of Michel Rolland, with whom Aaron Potts still maintains a strong relationship with, Aaron Pott began working at Chateau Troplong Mondot. To say Aaron Pott was surprised at the job he was offered does not really cover it. He was expecting a good, but still entry level gig at the exalted, St. Emilion vineyard. Aaron Pott was placed in charge of wine making, a position that required a very, quick, on the job, learning curve. From there, Aaron Pott remained in the Right Bank of Bordeaux holding an even higher position as he was made the director at Chateau La-TourFigeac. Aaron Pott completed his studies, earning a Masters Degree from the University of Bourgogne. Back in Northern California, Aaron Pott spent 3 years at Beringer as the International head of wine making. After a stint of St. Clement, he took a position at Quintessa, before setting up his own consultancy business. Blackbird, Fisher, Greer, Seven Stones and Quixotie are a few of his more illustrious clients. In 2004, he purchased 76 acres of land on Mt. Veeder, following that up in 2010, he obtained more vines in St. Helena and in 2012, he purchased additional vineyard land in Jericho Canyon and he added another vineyard to his growing portfolio in 2013, Alder Deutsch. In 2017, the name of winery changed officially to Aaron & Claire Pott and Daughters. Pott Wines produces staggering array for high, quality wine, which are mostly, still priced at a consumer, friendly level. The grape sources come from a myriad of parcels in the Napa Valley including Atlas Peak, Mt. Veeder, Pritchard Hill, Rutherford, Spring Mountain, St. Helena, Stags Peap and the famous, Stagecoach Vineyards. The terroir ranges from steep, hillside, mountain vineyards to soils with rocks, stones, loam, clay and volcanic material. 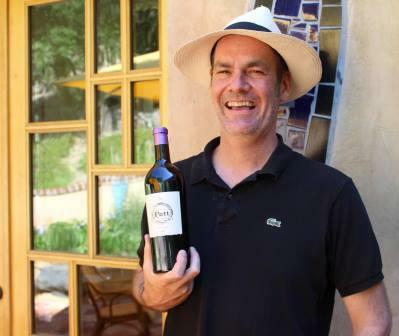 While most of the wines Pott produces are made from Bordeaux styled blends, that is not always the case as Aaron Pott also makes wine from Rhone grape varieties. Chesters Anvil is a partnership between Steve Lagier and Dr. Carole Meredith of Lagier Meredith Vineyard and Claire Pott. The wine made its debut with the 2007 vintage. Pott – 20M3 which is made from 100% Viognier that comes from a small, half acre parcel of vines at Chateauneuf du Pott. Pott – Original Gangster is made using 100% Grenache from the Stagecoach Vineyard. Pott – La Carte et le Territoire is a Right Bank Bordeaux blend styled blend with Merlot and Cabernet Sauvignon. Pott – Kaliholmanok is producing using 100% Cabernet Sauvignon from the upper, elevations on Spring Mountain. Pott – Actaeon is made from only 100% Cabernet Sauvignon planted in the Stag’s Leap appellation at Quixotie. Pott – Her Majesty’s Secret Service, named after a semi-obscure, James Band movie is produced from 100% Cabernet Sauvignon. The vines are planted in the Stagecoach Vineyard, on the Pritchard Hill side. Pott – Le Nouveau Western comes from Cabernet Sauvignon planted in Rutherford, in the Star Vineyard. Pott – Turf War is a Cabernet Sauvignon wine that comes from the Bisagno Vineyard located just above the Colgin vineyard on Tychson Hill in St. Helena. Pott – Incubo comes from 100% Cabernet Sauvignon planted on Mount Veeder, Napa Valley. Pott Wines is best served at 15.5 degrees Celsius, 60 degrees Fahrenheit. The cool, almost cellar temperature gives the wine more freshness and lift. Young vintages can be decanted for 1-3 hours, depending on the character of the vintage. This allows the wine to soften and open its perfume. Older vintages might need very little decanting, just enough to remove the sediment. Pott Wines is best served with all types of classic meat dishes, veal, pork, beef, lamb, duck, game, roast chicken, ribs, hamburgers, barbecue, roasted, braised, grilled dishes and stews. Pott Wines is also good with Asian dishes, hearty fish courses like tuna, salmon, mushrooms and pasta. The white wine of Pott is best served with all types of seafood and shellfish, sushi, sashimi, chicken, veal, pork and cheese. With a bright yellow and hay colored hue, there is freshness, length, minerality and blast of yellow citrus, white peach and ripe, sweet honeydew melon. Aged entirely in terra cotta for 10 months, the wine leaves you with just squeezed citrus, white peach and freshness. Boysenberry, hints of dark cocoa, earth and just a bit of truffle kick things off. But the petal hits the metal in this medium/full bodied, forward, structured wine with the elegant combination of present, but polished tannins and pure, fresh fruits on the palate and in the finish. You can drink this early for pleasure or age it a few years. Lush, juicy, ripe, sweet fruits, silky, soft tannins, licorice, smoke and earthy black cherries are come to the party. Full bodied, concentrated, fleshy, soft, polished and long, this is already easy and fun to taste. Musty earth and espresso, with a pure, black cherry core of fruit is at the hear of this wine. Mountain fruit, flowers and a gentle softness to the tannins makes an interesting combination. From there, you also find ripe, smoke, black and blue fruits, concentration of flavor, energy and elegant tannins. In 2015, here, you find more balance than density, making this that lets this be fun to taste early in the life. Fresh squeezed boysenberry and cherries pop as soon as the wine hits the glass. Toss in a some thyme and a hint of chocolate and you have the blend for the perfume. Produced from 100% Cabernet Sauvignon, the wine is finesse in style, with elegant tannins and sweet, ripe fruits from start to finish. Inky, dark in color, the wine is big, rich, mouth coating, and packed with layers of dense, ripe, glycerin infused berries. Intensity and density, balance and acidity are at play here. There is a fabulous sense of purity to the fruit in this vintage. I could not stop drinking this beauty. Hey, if George Lazenby was this good, Roger Moore would never have become Bond! This is a stunner. Inky in color, dense, fat and rich, with layers of sweet, black fruits, ripe tannins, licorice and just a hint of coffee and chocolate to round things out. This is so good now and my instincts tell me, this will get even better in a few years. From 100% Cabernet Sauvignon, this must be from a fabulous source, as this consistently such a good wine. Polished, lush, spicy, juicy and fresh, the wine is all about the dark chocolate covered black cherries, hints of blueberry, licorice, vanilla and smoke. Round, fleshy and fun to drink, even in its youth, pop a cork now, if you prefer exuberant flavors, or age it for bit. Dark in color, the wine has salty tannins, crushed rocks, blackberry, plum and bitter chocolate galore. Concentrated and fresh, give this a few years to come around. Produced from 100% Cabernet Sauvignon, the wine is rich, powerful, opulent and loaded with sweet juicy, ripe berries, a hint of jam, espresso and bitter chocolate. Round, lush and polished in texture, this is already open for business. Silky, lush, sweet and spicy, loads of ripe kirsch is here in abundance in this forward styled wine. This delicious blend of almost exclusively Grenache with a just dab of Petite Sirah is clearly ready to go. From 100% Cabernet Sauvignon, the wine opens with floral, cocoa, smoke, cherry, licorice and espresso bean on the nose. On the palate, there is good freshness, texture, elegance, concentration and length. You can drink or age it, if you can keep your hands off it, as it seems to be already delicious! Wow, I swallowed that bad boy. It was just too damn tasty! And that says a lot as this was part of a fairly big tasting I was going through. The Arsenal showed a great mouth feel, with its layers of sweet, lush, juicy, ripe, dark red and black fruits, the wine coated your palate with silky tannins and lush, sweet, berries. This delicious, Right bank look alike is a super wine. Produced from a blend of 65% Merlot and 35% Cabernet Franc, The wine is open, soft, fresh, forward and easy to like, due to its elegant, approachable, lush, round nature. The wine leaves with you fresh, sweet, cherries and thyme in the end note. Smoke, tobacco, charcoal, tar, balsamic and dark fruits are out in front. Lush, tannic and long, but lacking the concentration found in my favorite wines from Aaron Pott in 2012, give this a little time to come around and allow the tannins fade. From 100% Grenache, peppery blackberries are all over the place. The wine is fresh, medium bodied, forward and leaves you with spicy, peppery, red fruits. Drink this on the young side. Truffle, licorice, blackberry and espresso scented wine offers a dose of sweet, ripe fresh black cherries and strawberry jam in the medium bodied, forward, open, silky finish. Espresso bean, vanilla, blackberry aromas waft from the glass. On the palate, this forward styled wine is silky, round and polished with a licorice and plum filled finish. Vanilla, spice, black raspberry, earth and espresso notes open to polished, ripe, dark red berries, soft tannins, dark cocoa and cherry in the open and already enjoyable finish. This will drink well on release. Dark cherry in color, vanilla, coffee bean, brown sugar and cherry pie aromas lead to a forward, sweet, slightly oaky, strawberry and herbal tinged finish. Full bodied, rich, intense and concentrated with delicious waves of ripe, sweet, licorice coated blackberries, cassis spice, cocoa and earth. This fabulous expression of California Cabernet Sauvignon can be enjoyed young as the fruit is so incredibly lush, round and open. The perfume opens with a blast of chocolate covered blackberries, black cherry, earth and spice. The wine is tannic and demands a few years of bottle age before the full level of pure, fresh, ripe cassis, berries, licorice and chocolate delivers its full punch. With multiple layers of plush, ripe, fresh, jammy black raspberries, the wine offers a serious intensity of flavors and ripe tannins. But it needs a few years for the tannins to smooth out the Rutherford dust finish before it begins to show its best. This Right Bank Bordeaux blend features 80% Cabernet Franc with Merlot and Cabernet Sauvignon. Ripe, sweet, jammy berries open the medium/full bodied, forward styled wine. This is already drinking well.